At one point or another in their lives, most people will experience some degree of shoulder pain. It may be secondary to a variety of underlying pathology. We report a case of shoulder pain caused by a granulocytic sarcoma (chloroma) in chronic myeloid leukemia (CML) patient misdiagnosed initially as synovitis. Although granulocytic sarcoma has many classic musculoskeletal manifestations, to our knowledge, a case of CML concurrent with chloroma of the shoulder joint has not been reported in the literature. We must not forget that the shoulder pain arising from granulocytic sarcoma may be the initial presenting feature of underlying hematological malignancy such as CML. Granulocytic sarcoma is usually associated with acute myeloid leukemia (AML), chronic myeloid leukemia (CML), and other myeloproliferative disorders. , The bone marrow is thought to be the origin of granulocytic sarcoma, which travels to extraosseous locations via Haversian canals. ,, Granulocytic sarcomas are found most often in bones, , particularly those of the face and cranium. The ribs, spine, and sacrum ,, may also be affected, but granulocytic sarcomas of the long bones are seen less often. Owing to its rareness in extremities, granulocytic sarcoma is an almost unknown tumor for the general orthopedic surgeon. A 38-year-old right hand dominant male was diagnosed as having CML, in March 2009, due to the presence of neutrophilic leukocytosis (2.25 × 10 8 /l; lymphocytes: 2%; neutrophils: 40%; basophils: 3%; mature myeloid cells: 51%, and myeloblasts cells: 4%) treated elsewhere. Patient was on capsule hydroxyurea 500 mg QID without interruption for the last 2 years. He complained of right shoulder pain of 3 weeks' duration and swelling. 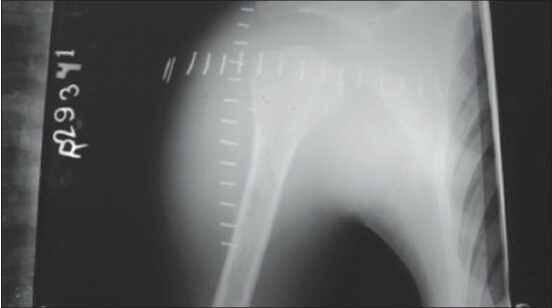 The patient reported to an orthopedic surgeon, who noted that the right shoulder had decreased range of motion and the patient was using the arm significantly less. Synovitis was at the top of the early differential, and the patient was treated conservatively with a combination of nonsteroidal anti-inflammatory drugs, appropriate antibiotics, and physical therapy for a period of 1 month. Symptoms persisted despite the conservative therapy and then the patient reported to this institution for further evaluation and management. At presentation, the patient was afebrile, but in a bad general condition. 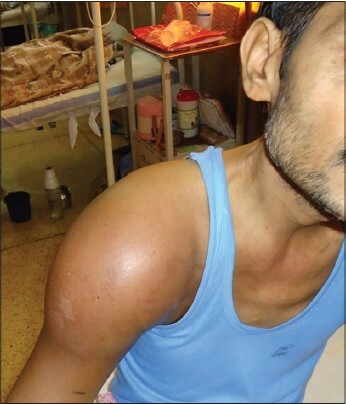 Physical examination revealed a diffuse swelling of 12 cm × 10 cm over the anterolateral aspect of right proximal arm, severe tenderness over the neck of humerus, and loss of shoulder motion [Figure 1]. The skin over the affected area was tense, shiny, erythematosus, and with dilated vein. Per abdomen examination revealed mild splenomegaly. There was no evidence of rash or petechiae or purpura. Other systemic examination was within normal limits. The patient was admitted for further evaluation. A complete hemogram showed raised erythrocyte sedimentation rate (ESR; 100 mm/h), C-reactive protein (CRP; 61 md/dl), and white cell count (12,600/mm 3 ). Differential leukocyte count showed; neutrophils - 54%, lymphocytes - 12%, monocytes - 1%, basophils 4%, eosinophils - 3%, blast cells - 0%, promyelocytes - 0%, myelocytes 4%, metamyelocytes 14%, and band cells - 8%. Coagulation time, bleeding time, clot retraction, and plasma fibrinogen levels were within normal limits. Anteroposterior (AP) radiograph of the shoulder joint shows soft tissue shadow with osteopenia. Congruency of the joint is maintained. X-ray findings were inconclusive [Figure 2]. MRI showed well-defined, heterogeneous, altered signal intensity soft tissue mass lesion involving proximal part of right humerus with cortical breaks in the humeral head and neck completely encasing and infiltrating it (7.9 cm × 7.6 cm axially and 14.7 cm craniocaudally) with marrow edema and infiltration into adjacent soft tissue [Figure 3]a-d]. Fine needle aspiration cytology (FNAC) from swelling shows large, round, hyperchromatic nucleus with scanty cytoplasm admixed with plenty of lymphocytes in hemorrhagic background suggestive of undifferentiated round cell sarcoma of soft tissue. Patient was advised biopsy for cytological correlation. Core needle biopsy was taken from the lesion and was sent for histopathological analysis after standard pathological processing. Biopsy revealed fibroconnective tissue stroma infiltrated by immature leukemic cells [Figure 4]a and b]. Once the diagnosis was confirmed, the patient was referred to the department of oncology and hematology for further management. Granulocytic sarcoma is an uncommon, malignant solid extramedullary tumor of immature myeloid cells. It occurs primarily in patients with leukemia or other myeloproliferative disorders,  but there are cases reported without any detectable evidence of leukemia in the peripheral blood or bone marrow. Allen Burns first described the lesion in 1811. Due to their characteristic green color that fades on exposure to air, King  in 1853 named these tumors as chloroma. This color is due to the presence of myeloperoxidase (verdoperoxidase) in the tumor cells. Rappaport  suggested the term 'granulocytic sarcoma' considering the association of these tumors to leukemia. Rigorous literature survey reviews revealed bone and periosteum as the most frequent site of involvement in patients with chloroma, , which usually occurs by migration of leukemic cells from bone marrow through Haversian canals. , Intra-articular chloroma are exceedingly rare with only few reports in the literature. ,,,, The tumor is capable of local soft tissue invasion resulting from destruction of the cortex and medulla with an adjacent soft tissue mass and periostitis. Nonspecific laboratory findings, vivid presentation due to its location and mass effects frequently pose a diagnostic dilemma for clinicians resulting in misdiagnosis. Diagnosis usually requires imaging such as CT,  MRI, and tissue biopsy. MRI is sensitive but lack specificity. Immunohistochemistry is found to be most useful in the diagnosis and characterization of these extramedullary solid tumors in non-leukemic patients. The diagnosis is usually confirmed by biopsy in patients with a history of leukemia. Occurrence of chloroma in patients with myeloid leukemia indicates warning signs of acute myelogenous leukemia or onset of accelerated disease or blast crisis of CML , and is usually associated with poor prognosis. In our case, the patient was treated with systemic chemotherapy and palliative radiotherapy. Owing to tumor progression, the response was poor and the patient died 6 months after initial presentation. The protean nature of its presentation owing to various sites of occurrence  and the similarity of the symptoms to those of a synovitis or arthritis, especially in early stages of musculoskeletal involvement mean that it is easily overlooked. It must be borne in mind that occasionally the initial presenting features of underlying hematological pathology such as CML may be shoulder pain arising from CML-associated granulocytic sarcoma. Present case report is an effort to encourage general orthopedic surgeons to consider granulocytic sarcoma amongst their differential diagnoses of shoulder pain, especially in conjunction with leukemia. Chloroma requires early detection because a focal relapse could eventually be alleviated by local therapy (e.g. radiation). Diagnosis, however, can prove to be an arduous task because clinical and laboratory data are inconclusive resulting in misdiagnosis and delay in therapy. Presence of musculoskeletal complaints in leukemic patient should alert the attending trauma surgeon to carry out rigorous diagnostic workup for associated and underlying pathology. We report this case due to its rarity and varied delayed mode of presentation, and so that chloroma is considered as a differential diagnosis in the mind of orthopedic surgeons tackling osteoarticular pathology in leukemic patients. We want to acknowledge the doctors and senior colleagues for providing fruitful and critical comments on the draft of this paper. 1. Hermann G, Feldman F, Abdelwahab IF, Klein MJ. Skeletal manifestations of granulocytic sarcoma (chloroma). Skeletal Radiol 1991;20:509-12. 2. Barnett MJ, Zussman WV. Granulocytic sarcoma of the brain: A case report and review of the literature. Radiology 1986;160:223-5. 3. Mostafavi H, Lennarson PJ, Traynalis VC. Granolocytic sarcoma of the spine. Neurosurgery 2000;46:78-83. 4. Pui MH, Fletcher BD, Langston JW. Granulocytic sarcoma in childhood leukemia: Imaging features. Radiology 1994;190:698-702. 5. Fritz J, Vogel W, Bares R, Horger M. Radiologic spectrum of extramedullary relapse of myelogenous leukemia in adults. AJR Am J Roentgenol 2007;189:209-18. 6. Liu PI, Ishimaru T, McGregor DH, Okada H, Steer A. Autopsy study of granulocytic sarcoma (chloroma) in patients with myelogenous leukemia, Hiroshima-Nagasaki 1949-1969. Cancer 1973;31:948-55. 7. Neiman RS, Barcos M, Berard C, Bonner H, Mann R, Rydell RE, et al. Granulocytic sarcoma: A clinicopathologic study of 61 biopsied cases. Cancer 1981;48:1426-37. 8. Suzer T, Colakoglu N, Cirak B, Keskin A, Coskun E, Tahta K. Intracerebellar granulocytic sarcoma complicating acute myelogenous leukemia: A case report and review of the literature. J Clin Neurosci 2004;11:914-7. 9. Ripp DJ, Davis JW, Rengachary SS, Lotuaco LG, Watanabe IS. Granulocytic sarcoma presenting as an epidural mass with cord compression. Neurosurgery 1989;24:125-8. 10. Buckland ME, Scolyer RA, Donellan MB, Brew S, McGee-Collett M, Harper CG. Spinal chloroma presenting with triplegia in an aleukaemic patient. Pathology 2001;33:386-9. 11. Elghissassi I, Inrhaoun H, Mrabti H, Errihani H. Nonleukemic granulocytic sarcoma of knee: A case report. Case Report Med 2010;2010:235295. 12. Castella A, Davey FR, Elbadawi A, Gordon GB. Granulocytic sarcoma of the hard palate: Report of the first case. Hum Pathol 1984;15:1190-2. 13. Burns A. Observations of surgical anatomy. Head and Neck. Edinburgh, Scotland: Thomas Royce and Co; 1811. p. 364-6. 14. King A. A case of chloroma. Monthly J Med 1853:17:97. 15. Rappaport H. Tumors of the Hematopoietic System. Atlas of Tumor Pathology, Section 111, Fascicle 8. Washington, DC: Armed Forces Institute of Pathology; 1966. p. 241-3. 16. Azzarelli V, Roesasman U. Pathogenesis of central nervous system infiltration in acute leukemia. Arch Pathol Lab Med 1977;101:203-5. 17. Gomez N, Ocon E, Friera A, Penarrubia MJ, Acevedo A. Magnetic resonance imaging features of chloroma of the shoulder. Skeletal Radiol 1997;26:70-2. 18. Muellera M, Calvo AR. Acute Shoulder Monoarthritis in a Patient With Acute Myelomonocytic Leukemia With Novel Translocation t (5;13). World J Oncol 2010;1:50-1. 19. Lincopán SA, Valencia MY, Carrasco LC, Barraza OX. Myeloid sarcoma: Report of one case with trisomy 11. Rev Med Chil 2011;139:914-6. 20. Agarwal N, Tepe EM, Mishra A, Ward JH. Relapse of acute promyelocytic leukemia presenting as granulocytic sarcoma in the hip. Ann Hematol 2006;85:741-2. 21. Libson E, Bloom RA, Galun E, Polliack A. Granulocytic sarcoma (chloroma) of bone: The CT appearance. Comput Radiol 1986;10:175-8. 22. Held P, Gassel WD, Weigelt C, Köhler F. Chloroma in the blastic crisis of chronic myeloid leukemia: MR tomography findings. Bildgebung 1990;57:44-7. 23. Bassichis B, McClay J, Wiatrak B. Chloroma of the masseter muscle. Int J Pediatr Otorhinolaryngol 2000;53:57-61. 24. Binder C, Tiemann M, Haase D, Humpe A, Kneba M. Isolated meningeal chloroma (granulocytic sarcoma): A case report and review of the literature. Ann Hematol 2000;79:459-62. 25. Byrd JC, Weiss RB, Arthur DC, Lawrence D, Baer MR, Davey F, et al. Extramedullary leukemia adversely affects hematologic complete remission rate and overall survival in patients with t (8;21) (q22;q22): Results from Cancer and Leukemia Group B 8461. J Clin Oncol 1997;15:466-75. 26. Fleming DR, Greenwood ME, Garrison J, Geil JD, Romond EH. Lymphocyte infusion for delayed extramedullary relapse of acute leukemia following bone marrow transplantation. Leuk Lymphoma 1996;21:525-8.